Drew Lock is the first freshman quarterback to start for Missouri in 20 years. COLUMBIA, Mo. — Besides touching the ball on every down, Missouri’s center Evan Boehm and quarterback Drew Lock share a unique relationship. They’re both from Lee’s Summit, Mo., a Kansas City suburb, and both know how it feels to earn a starting role earlier than anticipated. Lock is the first freshman quarterback to start for Missouri in 20 years and is set to make his second start Saturday night when the Tigers (4-1, 1-1 SEC) host No. 11 Florida (5-0, 3-0). Boehm, a senior and team captain, was a four-year starter at Lee’s Summit West, across town from Lock’s alma mater of Lee’s Summit High. He has started 45 consecutive games, six shy of the school record. Boehm remembers his first interaction with Lock. At that time, they were rivals, not teammates and he taunted Lock with a Justin Bieber chant. "He was playing basketball, and I was in the student section," Boehm said. "Every time he grabbed the ball, I made it a point that we started the Justin Bieber chant. "When he came over and caught a pass on the 3-point line right next to us, we just started going after Drew. He stopped, shot it and made it, and we just go ‘Well, we can’t do that one anymore guys.’"
Their relationship grew when Lock came to Columbia this past winter for an official visit. "He hosted me on my visit," Lock said. "I actually played his high school that same day in basketball. Evan’s a good guy. He’s definitely warmed up." Lookin’ good! Check out our gallery of SEC football cheerleaders. Boehm and Lock also are both recipients of the Thomas A. Simone award presented annually to the most outstanding high school football player in the Kansas City metropolitan area. Boehm became the first offensive lineman to win the award in 2011, and Lock won in 2014. When Lock took his first snap from Boehm in Missouri’s season opener against Southeast Missouri State, it was the first time a Simone award-winner ever had received the ball from another as collegiate teammates. "It’s really cool," Boehm said. "Drew and I have already talked about signing a couple pictures for Mr. Simone and giving them to him for a little Christmas present just because of what that award means to us and to Kansas City." Lock is the first freshman quarterback coach Gary Pinkel has started in his 25-year career. Pinkel said it’s a comfort Lock is taking snaps from a veteran. "Having an experienced guy like Evan there is really a huge plus," Pinkel said. "I don’t think there’s any question about it. Really, having a bunch of seniors up front, that helps in a lot of ways." Lock has completed 36 of 53 passes this season for 361 yards with three touchdowns and an interception. 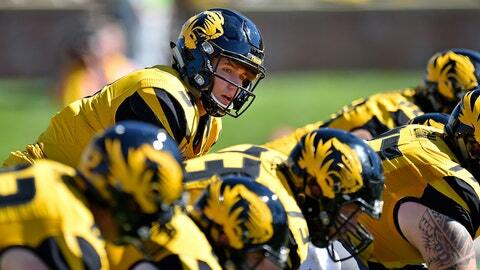 With Maty Mauk suspended indefinitely, Lock gets the call for Missouri’s 104th homecoming game. Lock said Boehm helps him decompress from the attention and pressure that comes with a starting role. "That’s just the type of guy I am," Boehm said. "I just want to make sure that Drew’s OK, and still enjoys doing what he’s doing. Sometimes we just turn on the TV and just hang out and talk."